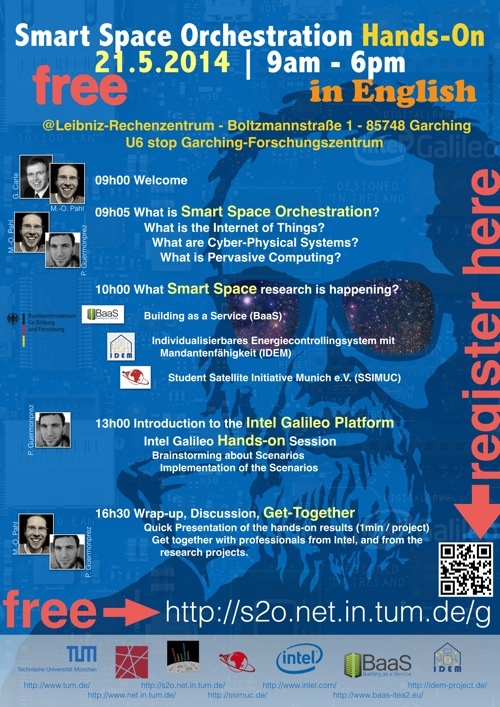 Marc-Oliver Pahl | The 1st Smart Space workshop in cooperation with Intel Galileo takes place May 21, 2014. Come! On May 21, 2014 about 60 professionals from different companies, PhD, graduate, and undergraduate students participated at the Smart Space Orchestration Workshop at Technische Universität München. The event started with the first keynote by Paul Guermonprez from Intel about the Internet of Thing, and the second keynote by Marc-Oliver Pahl from TU München about Smart Space Orchestration. Then the research projects Building as a Service (BaaS), Individualisierbares Energiecontrollingsystem mit Mandantenfähigkeit (IDEM), and the activities of the Student Satellite Initiative Munich (SSIMUC) were introduced. The keynotes gave a very interesting overview on the Internet of Things, Cyber-Physical Systems, Smart Space Orchestration, and Pervasive Computing. Paul introduced a bottom-up perspective on the Internet of Things while Marc-Oliver raised several current research challenges after introducing into the field of Pervasive Computing. The afternoon started with an interesting introduction to the Intel Galileo platform that was followed by a hands-on session. Using the Galileo boards and different sensors such as temperature of audio sensors, the participants implemented diverse smaller scenarios that they presented to the audience afterwards. The day ended with a get-together at the Technische Universität München where the participants discussed about the day, and about challenges and opportunities of the Internet of Things. The workshop was a good opportunity to raise awareness for the ongoing BaaS research activities for a broad diverse audience. If you have questions or suggestions around the event please contact us. Feel free to spread the news about the event!